Growing up in a house with a hockey-hungry dad and an equally Canuck-crazy brother, one would assume that playoff insanity is nothing new for this girl. 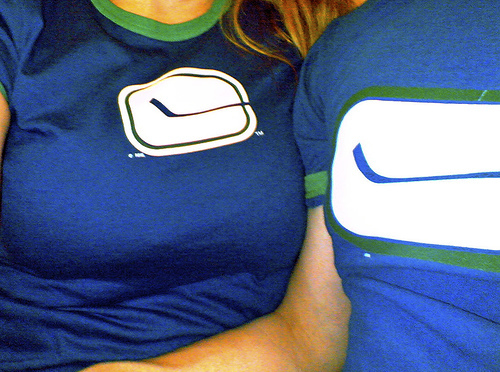 The Vancouver Canucks are BC’s team and there’s absolutely no team I’d rather see bring home the Stanley Cup. However, that said, I must admit that any excitement I’ve felt, any enthusiasm I’ve displayed and any cheering I have directed toward the Canucks has been of the bandwagon variety. I’m a fickle fan and will be the first to admit it. Perhaps it’s because of this that playoff fever had never struck me down and got me hot. That is, however, until now. 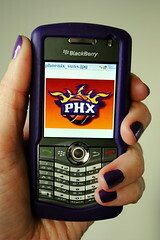 Before I discovered the Phoenix Suns and how thrilling NBA basketball is for me, I never had a “thing”. Everyone has that one “thing” they get excited and passionate about and any “thing” that I’d ever pursued simply waned as I went along. Not so in this case, and today I find myself gearing up for my first playoff season as a bona fide, blissed out, babelicious fan. Like the Vancouver Canucks, my beloved Suns have grabbed third seed in the Western Conference (much to the surprise of many). Tonight the puck drops at GM Place between the Canucks and the LA Kings, and we’re three sleeps away from a first-round tip off between the Suns and the Portland Trail Blazers on home turf. No matter which sport is yours or which team you’re cheering on, playoff season is bound to be anything but dull. So to you and your boys, whichever boys they may be, this Gatorade’s for you. You need a newer Blackberry. One with a full Qwerty keyboard. Do NBA players and fans grow playoff beards?